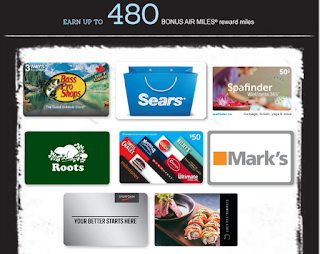 The merchant gift cards included are Spafinder, Bass Pro Shops, Sears, Roots, Cara Foods, Mark's, Sport Chek, and Joeys. I'm not sure if I'll partake this time but who knows my plans change every hour! FYI - metro in ON has an offer this week that involves mostly same cards - 65AM per $50 card. See page 12 of flyer. Keg, Bass pro, roots, sears, marks.